This 24 ounce spray bottle sells for about $16 and will treat four outfits. Every year about this time, the ticks start to come out near where I live. The deer ticks are fairly common and carry lime disease which can be quite nasty. We are also starting to see mosquitoes that carry the west Nile virus. In many other areas of the country all types of nasty biting insects are appearing, many of which spread diseases that can be debilitating or deadly. 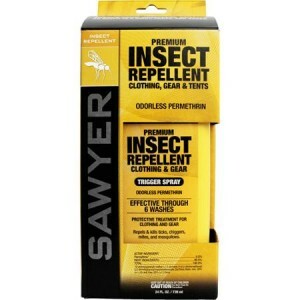 That brings up the big question should you use an insect repellant such as Permethrin. Now personally I avoid pesticide sprays and other chemicals as much as possible. But sometimes you have to weight which is the most dangerous. 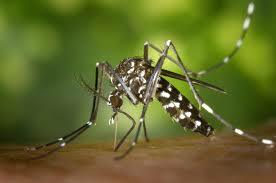 For example are the insect borne diseases a bigger threat than the insect repellants. Some of these diseases are new to the United States and have been carried in by illegal immigrants. Recently Sawyer sent me a 24-ounce spray bottle of Permethrin. This is a spray that you can spray on your clothing, tents and other gear. It will stand up to six washing on your clothing or about 42 days of sun exposure on your tents and other gear. It will repel and actually kill ticks, mosquitoes, chiggers, mites and many other kinds of insects. The active ingredient in Permethrin is a synthetic molecule similar to pyrethrum which is taken from the Chrysanthemum flower. After drying, it is odorless and will not stain or damage clothing, fabric, plastics or any of your gear. The bottle I have is the 24-ounce size and it will treat four complete outfits consisting of a shirt, pants and socks. You spray it on the clothes and let it completely dry prior to wearing them. The instructions on the packaging are thorough and warn you to never spray this on your skin. Like I stated I am not a fan of insect repellents, but in many areas of the world, the risk of disease from the insect bites are worse than the dangers of the repellent. There are times when I will use Permethrin on my clothing and gear. I like this much better than the alternative sprays, containing chemical such as DEET which are applied directly on the skin. I can testify to one thing Permethrin will keep insects away and prevent you from being on some insects menu. This entry was posted in medical and tagged permethrin. Bookmark the permalink. I have used this stuff multiple times on uniforms. Always wear rubber or disposable gloves when using it for touching the damp cloth. Put the item to be sprayed on hangers and remember to get all outside surfaces. Spray it till the cloth gets damp and let it dry completely before taking it off the hangers. Spray it extra thick on heavy sweat areas and areas that the skin presses against like the shoulders. Sweat does also wash out the the repellant. Never spray it on the skin, not even to reapply, it is carcinogenic we were told. Before you freak out and say “I will never use this”, it does work and it is considerably less toxic then the other chemicals they gave us to use to treat uniforms and mosquito nets. I prefer this to the stuff they gave us treat our uniforms against sand fleas. Our unit NBC guy was a licensed chemist and when he read the packages of sand flea dip he refused to use it and said no one in the unit should because it was that hazardous. He was threatened with court martial and he told them to do it because he would not use something that hazardous. The unit backed down, probably so the rest of us wouldn’t find out how bad the stuff was. When I was in Public Works, all of our field crews had work clothes provided by a uniform service which were so treated, and in a large municipal government having several thousand field employees in various public works, parks & rec., survey crews, road program management, schools maintenance, etc. the County Health Department and our Risk Management Division validated the determination after ten years experience that issue of treated uniforms on a weekly basis reduced vector exposures and reduced lost time with fewer adverse effects than the former practice of having employees apply DEET directly to the skin. Treatment of field uniforms was afterward specified in the uniform service contract, using the language, standards and specifications developed for the Army, and made available through GSA for localities receiving Homeland Security Preparedness Grant monies and able to ride on Federal contracts.